WeAreTeachers is pleased to welcome guest teacher blogger Erin Lynch from the Sadlier School Core Literacy blog. Find Erin’s blog, as well as free language arts lesson plans, classroom activities and games, at Sadlier’s PubHub. The papers are passed out, pencils are sharpened and fresh test booklets are positioned on students’ desks. It’s that time again: spring testing season. Whether administering a cumulative unit exam, paper-based state tests or the newer Common Core assessments online, we want students to do their best. To use a marathon-running analogy, they’ve been preparing all year and this is race day. In the days and weeks leading into assessments (or to approach assessments all year long), here is a collection of printable posters, handouts and tools to ensure your students are ready to show what they know when the clock starts. 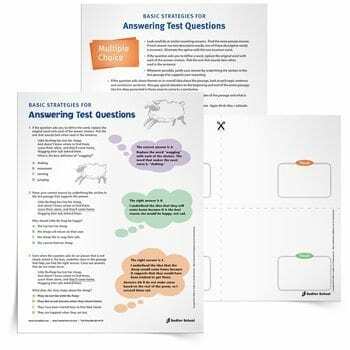 The Basic Strategies for Answering Test Questions tip sheet and handout is the tool for students who are just learning how to tackle the different types of test questions. From multiple-choice to short answer and essay, these strategies will take students all the way through any standardized test. Particularly helpful are the specific tips for multiple choice, like thinking about theme as “idea + attitude” and focusing on the structure of a reading passage to help find the main idea. The best test advice comes in short, easy-to-remember tips, like those on the Test-Taking Tips sheet. Teach and reinforce these tips, like having students estimate how much time they’ll need to spend on each question so they don’t spend too much time on basic questions (think multiplication facts or vocabulary). 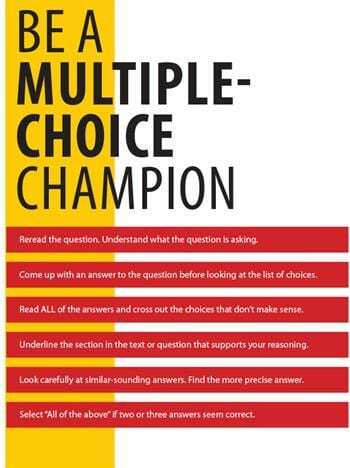 Use the Multiple-Choice Champion tip sheet as a poster or as the springboard for a class-created anchor chart. And use the ACE Open Responses handout to assess and give feedback on student writing leading up to test day. Each assessment asks students to do so many different things—identify the word, analyze the quotation, determine the main idea. 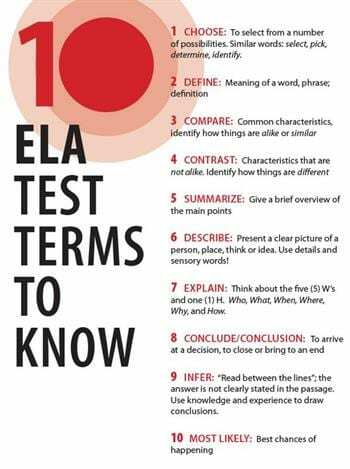 Help students understand what questions are asking of them with the list of ELA Test Terms to Know. With this list, students can sort questions by skill—is the question asking them to compare and contrast, summarize, or infer? We know the mistakes that students make when they take tests. We’ve watched them reread the entire passage to answer one small question, or spend 30 minutes on the first question, leaving them 15 minutes for the rest of the test. 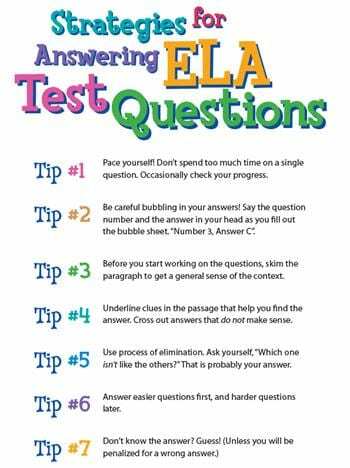 Address those concerns and others with these Strategies for Answering ELA Test Questions. The open response or essay is when students should bring their writing A-game. 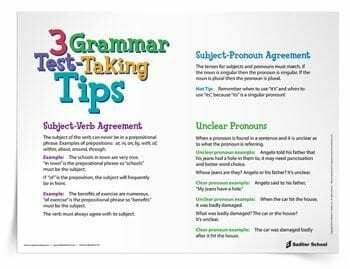 They’ll refine their writing with the three Grammar Test-Taking Tips. The first one: Make sure subjects and verbs are always in agreement. 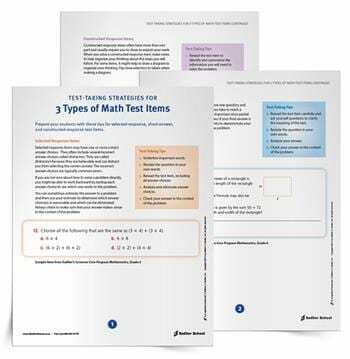 In a math assessment, students may come across selected-response, short-answer and constructed-response items. Give them the tools to tackle all three, including how to approach distractors and how to use context clues in math responses. Test day isn’t the first time students will be tackling multiple-choice questions or essay prompts, but with these resources, you can make sure they’re ready to show what they know, without the test getting in the way. Erin Lynch is a literacy specialist and learning facilitator at an elementary school in Greenwich, Connecticut. Follow her blog, Core Literacy, a K–5 resource for teachers of reading and language arts.